The ECSI4500 Series is equipped with an IP30 metal case design for industrial harsh environment conditions, the hardware comes with DIN Rail or wall-mount options, which are suitable for locating in plant or cabinet install spaces. The switches operate at a wide temperature range, from -40 degree C to 75 degree C, to meet demanding conditions and maintain outstanding performance at the same time. Meanwhile, the ECIS4500 Series supports E-Ring (Edgecore proprietary ring technology with a recovery time <20ms) that enables the network to detect and recover from incidents without impacting users, meeting the most demanding rapid recovery times when problems occur. The ECIS4500 PoE switches deliver up to 30 watts of power per port along with data over standard Ethernet cabling. 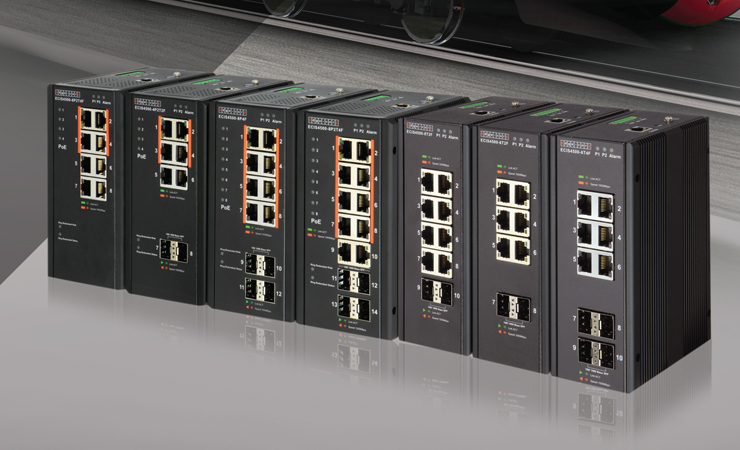 The switches can be used to power any IEEE 802.3af/at-compliant PoE PD devices, and include PoE power management features that ease the deployment effort and PoE power budget planning, as well as eliminating the need for additional wiring to reach a power source. ECIS4500-8P2T4F supports Ultra PoE (60W) for Port 1 and Port 2.